Yet another digitised newspaper collection, but this is one of the best I’ve yet come across. 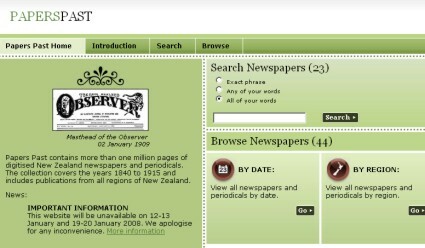 It is Papers Past, the National Library of New Zealand’s website which boasts one million pages of digitised New Zealand newspapers and periodicals, covering the years 1840 to 1915, all of it freely available. The site is a model of clarity and usefulness. It features forty-four newspapers (twenty-three of them word-searchable so far) from all regions of New Zealand, from The Daily Southern Cross to the Wanganui Herald. There is a simple search option and and advanced option, which allows filtering by date, paper and content type (articles, advertisement or illustration captions). And there are plenty of relevant results for the early film researcher. The word ‘kinetoscope’ gets 312 hits; ‘kinemacolor’ gets 168; ‘bioscope’ scores 1,133. Nor is all the content restricted to New Zealand news, as many of the results are news reports from around the world (particularly UK and USA). There are many useful but unobstrusive extra features, such as the option to have preview images; to sort results by best match, date, title (article or newspaper) or content type; a search history facility; and a welcome use of ‘breadcrumbs’ (a line of links below the top menu to show you where you are on the website). Just about the only thing to criticise is some amusing slips with the OCR (optical character recognition), so that Eadweard Muybridge’s The Horse in Motion gets translated as The House in Motion. And, yes, it lets you see the underlying OCRed text as well as the image of the scanned document. Plus the whole site is available in English or Māori. Luke: Thanks for pointing this out. The people of Dunedin, NZ are looking to rebuild their High Street cable tramway, which they had abandoned in 1957. It had been the last Hallidie-type cable tram outside of San Francisco. This will be a very useful source for research. They hope to get the new line built in time for the 2011 Rugby World Cup. At times I think I could come up with another blog which just points out digitised resources and the like in general. Though there is one such service already, with RSS feed, which I do recommend, http://www.researchbuzz.com. I find a whole manner of things from there. Luke: I’ll subscribe to that one. Thanks for the lead. Great news. I’m planning a round-up item on all the various digitised newspaper collections I’ve covered on the blog, and will add this. I’m just awaiting the news of the big Australian newspaper resources just around the corner before doing so.